The tragic passing of one of the club's most promising young footballers, Ricky Mc Dermott, has taken place. A former pupil of Ballinlough National School and a fifth year student at St. Olivers Post Primary School (Oldcastle) Ricky was renowned for his broad smile and his happy-go-lucky personality which made him a popular figure on and off the field. The earliest memories of Ricky at Ballnlough GFC are of a small burly youngster who would always be first out at training, but it wasn’t long before his strength and determination made him distinguishable in the red and white jersey that he wore with such pride. He was a major part of a successful period for the club at underage level and he starred as U-14, U-15, U-17 and Minor (St. Oliver’s) titles were claimed in recent years. 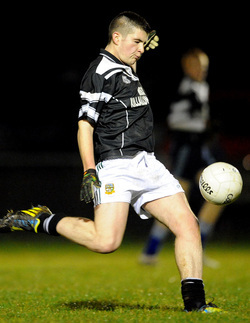 His high scoring rate became the norm; he scored 0-9 against Ballinabrackey in the U-15 final of 2010. His remarkable ability to strike a free off the ground became evident on that day, when as a 14 year old he glided a '45 through the stiff breeze and over the bar. A year later he produced a breathtaking display while scoring 1-15 in a memorable extra-time victory over Bru Na Boinne in the U-16 semi-final. Arguably his proudest hour came later in the same year when he guided Ballinlough to an U-17 title, scoring 1-8 in the final against Wolfe Tones. His talent didn’t go unnoticed at county level and in 2012 he featured for the Meath U-16 team in the Gerry Reilly tournament, it was his first step in fulfilling the footsteps of his heroes Jody Devine and Peadar Byrne. Having turned 17 only two weeks ago he had already established himself as a regular on Ballinlough’s intermediate team and he was among the scorers in last Sundays league win over Nobber. His leadership, dedication to training and his desire to win set an example for young and old and will be sorely missed by all at Ballinlough GFC. The Mc Dermott family have lost a son and brother and we have all lost a true friend, but maybe we can all find some solace in the traits that Ricky displayed while playing Gaelic football - courage, bravery and integrity.